I like rhythm games. Ever since playing the likes of Guitar Hero and Rock Band on my X360 console (*gasp* yes, I do actually own a console) I was hooked. It's been awhile since I've had a Guitar Hero or Rock Band party but I still appreciate games that are similar in terms of their mechanics. Consequently, I decided to give Frederic: Resurrection of Music a look since it seemed to fit that mould, not to mention it sounded like there was a really zany plot as well. Playing as a dead Romantic composer? Hell yes. But would this be a case of it's so bad, it's funny? You play the role of a recently resurrected Frederic Chopin, one of the greatest Polish composers of all time. The world you're brought back to, today's world, is filled with "soulless music labels" and "mass-produced popstars" which have hindered all creativity. It's up to you to bring back creativity in music, by challenging other artists to musical duels (such as parodies of Eminem and the Cranberries). I wasn't expecting a great plot from a game where Chopin is mysteriously raised from the dead but even with my low expectations I was cringing at some of the cutscenes. The scriptwriting is terrible. The "megatons of humour" must've been lost in translation. Also I would've liked it if the song descriptions were in English instead of Polish. For those who have played rhythm games before, you'll know what to do. A bunch of notes will fly towards you Guitar Hero style and your job is to hit a corresponding key at the right time, which is when the note crosses a certain line. If you had a touchscreen device (which I think is how this game is meant to be played) you just hit the appropriate key on the screen. If you don't have a touchscreen device you'll have to use the keyboard and/or mouse. 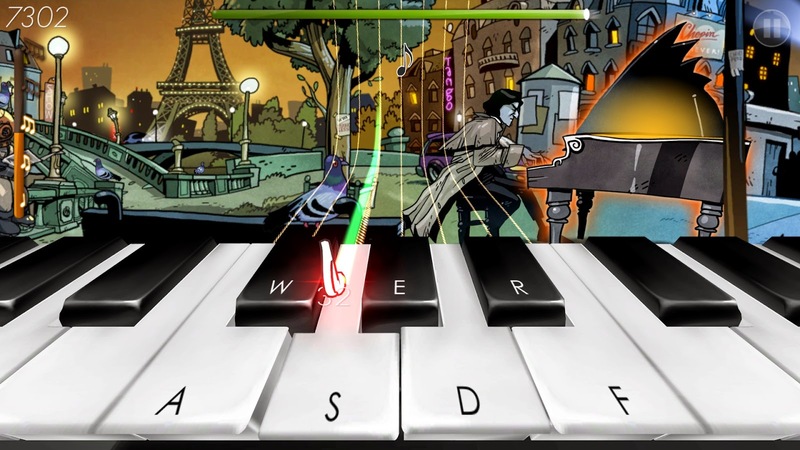 If you're using a keyboard and/or mouse, the game is actually quite challenging, especially on harder difficulty levels or levels towards the end of the game. While there is the ability to reconfigure the keyboard, it still doesn't really help because the computer keyboard just doesn't have the right feel when compared to an actual keyboard. Consequently, I end up using the mouse most of the time to hit the keys along with the keyboard to press the correct letters when I generate "golden notes" and to hit the spacebar when I charge up an "attack". Using the mouse works for the easy parts of the tracks but become nigh on impossible when there are a quick sequence of notes. Overall, I did enjoy the game but only because I wasn't taking it too seriously. If I really wanted to try for a good high score I think you need to invest in a tablet - and if you end up doing that, you might as well just buy the app version of the game instead of the PC one. The Three Muses. The ones responsible for raising you from the dead. The voice acting is pretty appalling in this game. At least there's nothing wrong with the pronunciation but the delivery seems very wooden at times. Often you'll feel the characters lack conviction in what they're trying to say. Being a music game you'd expect this part to be good and overall, I liked the several Chopin remakes/remixes and there were even a few I recognised (so they're obviously using popular stuff). If you ever wanted to hear a Country 'n' Western version of the Funeral March or a reggae version of Polonaise in A, Op. 40 No. 1, then you've come to the right place. Oh you also get the MP3s for the soundtrack for free when you purchase the game - choice! The game has adopted a very European comic book art style which I like. The game is very short and will take you under two hours to complete but that's probably because there's only nine chapters (if you don't include the extra three levels that are unlocked by completing the game on normal, hard and hardest difficulty). You could always play on higher difficulty levels and there are also Steam achievmenets and Steam Trading cards to collect. There are even leaderboards so you can compete against friends or other players for high scores. Yes I know Frederic Chopin is Polish, but that's not what this section is about. The game is reasonably well polished but there are some sloppy spelling mistakes plus the fact when you click any key you skip cutscenes - which is a minor inconvenience but also means it's frustrating doing things like taking Steam screenshots :). 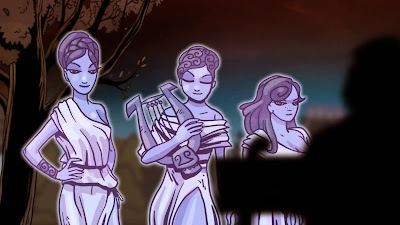 The story in Frederic: Resurrection of Music tries its best at sounding funny but unfortunately comes off sounding a bit flat. However, the game is an amusing distraction and the remixes of Frederic Chopin's most popular works are thankfully pretty good. Where else can you play a Country 'n' Western version of Chopin's Funeral March?